Apologies in advance for a rather rambly, stream of consciousness post. Riding at the horse park for our competition was a bit surreal. Spring Bay is a bit of a unique horse trial in a lot of ways. Obviously, running XC at a different venue than SJ and Dressage is interesting, but it is more than that. As we walked from the trailers to Dressage or SJ at the horse park, you could see the Land Rover Kentucky Three-Day Event coming together. Crews worked to build tents and platforms around Rolex Stadium. The grass on the XC field was being mowed and tended to. Even the barns not being used for our event were cleaned and prepped, ready for the 5* horses to show up. 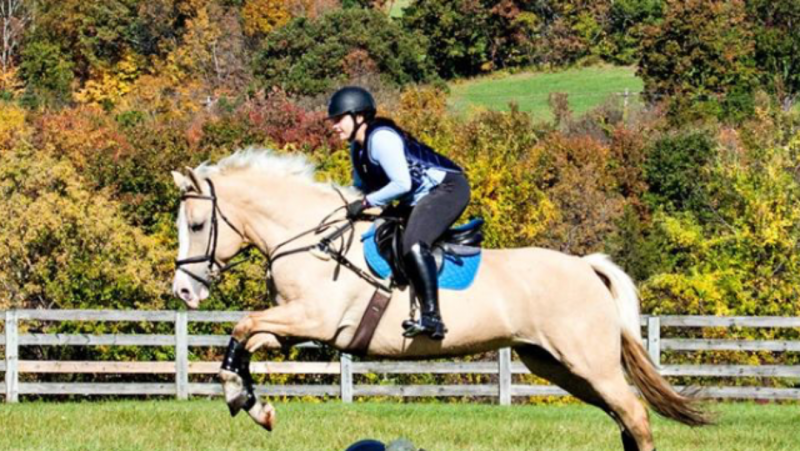 It’s easy enough to go to a schooling show, especially in eventing, and feel like you belong. Most everyone is on either an OTTB or a QH or a mutt of some kind. (sorry May). It’s pretty rare to see the newest or the best tack/equipment etc on the school ponies poking around baby starter. If you go often enough, you get to know most of the riders/trainers/horses on sight. So I have gotten… pretty comfortable in that atmosphere. Then a couple of weeks ago, I ventured to the Kentucky Horse Park, as it preps for KY3DE, my over-sized thelwell pony siting in the trailer, ready for Starter. I watched the Prelim riders perform their long and complicated Dressage tests (to me anyway). I walked the SJ course when it included 3 combinations, a triple bar, and was set to full prelim height. Thinking back on it, it was the first time I have ever been in a competition ring with jumps set to that height. Then I picked up on the chatter, which horses were just out to do the CT to start off their season, and which horses were stepping down for a confidence building start. Confidence building?! I think we should respect the person that chooses to compete at Novice because that’s where they are happy and are enjoying the sport just as much as the person who is running around Kentucky. I have told myself for years that getting to Novice would be really eventing, but the truth is, a couple of weeks ago, me and my horse went to compete three times in three different phases. And we were competent and competitive in each phase. To me, that is eventing. So I look my own doubts head on, and I remind them that being an eventer and a horseperson means showing off your horse to the best of your abilities in that moment. My choice to run Starter doesn’t need any explanation beyond the choice to set myself and my horse up for success. In fact, it needs FAR LESS explanation then anyone who pushes their horses up the level without proper fitness or training. Moral of this story? Do right by your horse, and the eventing community will always support you. I did have one advantage on Show Jump day though. We walked the course when it was set for Prelim. In case you are wondering, walking a course when it is set for Prelim makes Starter look REALLY small. Still though, it was a complicated course with 0 straight lines in it… I wish I was kidding. However, I had a plan. I was going to ride May forward enough that I wanted to pull… and then not pull… Other than that, I was going to get her body straight and square to ever fence. I wasn’t going to worry about distances but concentrate on my pace, line, and balance. Jump 1 was the best jump 1 I think I have ever ridden in my life, and May jumped it so well. (It’s the top pic of this post). Then, we bent around to get a great jump at 2…. and again to jump 3. It felt AWESOME. Usually, my first three jumps on course are me getting into a rhythm and don’t flow great. This time, I HAD the rhythm, balance, and line, and they jumped GREAT. So here I am. So super excited about how things are going. I made a great turn to Jump 4… I got her square… and she suddenly decided to RUN at it. It’s really hard to see in the video, but she wanted to get flat on me. I halt halted, but it threw us off enough to tap 4 pretty hard (I am shocked it didn’t come down). That also meant that we didn’t land as balanced as we needed to in order to get a good turn to 5. I didn’t put my leg on as soon as I should have, and the distance came up ugly. She jumped that one awkwardly but kept it up. The turn to 6 was seriously what jumping dreams are made of, and she jumped it out of stride. Then an easy bending line to 7. Despite our cross cantering, the rhythm and line were good, so she popped over it easily. Then… we made kind of an awkward turn to 8, so she jumped it kind of funky. Oh well, it was still easy for her. Jump 9 just came up out of stride, and we made a sweeping turn to jump 10. I had to put my leg on for the big spot, and she jumped it great. Obviously, I was super happy to have a double clear round. I think that it, honestly, would have rode BETTER if the jumps had been a little bigger. May was super unconcerned with distances to the point where it actually made things more difficult. She was also very unconcerned with what any of the jumps looked like. There was no peaking or over jumping. Just happily cantering around. However, I am VERY VERY happy that I managed to execute my plan. I am also happy that, in the pics, when the distances got ugly, I kept my shoulder back and my body over her center of gravity… instead of throwing my whole body up her neck. As a result, we maintained our 29.3 score and 2nd place standing going into cross country on Sunday! I want to start the recap of this weekend’s event with so many “thank you”s. I am not sure who I can thank first or even the most. Obviously, a massive shout out goes to my friend that really pushed me to sign up for this event. Over the last several months, she has gone from a girl I knew at the barn, to the girl I go to the gym with, to one of my biggest cheerleaders. She got 5,000 questions from me about pretty much everything, and she had to reassure me maybe another 5,000 times. However, I am so happy she pushed me to do this horse trial. Hereby, she shall be dubbed “Motivational Friend” hahaha. On that note, I need to thank the rest of the barn family. We had tons of people show up both days of the show to watch and help. We had people help out at the barn while we were gone. Our younger riders volunteered both days and were a massive help to the show. My teammates all stepped up to help one another and make sure our ponies were as comfortable as possible over a crazy weather weekend. My trainer gets a HUGE shout out. Not only did she compete her own horse, but she was completely committed to each of us competing in the lower divisions. She took my warmups and prep just as seriously as everyone else, even though I was only doing starter. It was only my second time showing with her and the first show was a super soft schooling show. At this show, between the atmosphere and the weather, it was an incredible experience. It really is an amazing confidence boost to have a pro in your corner who knows you, knows your horse, and totally has faith. Finally, I am so incredibly thankful for my amazing husband. I ended up recommending that he stay home on XC day due to the weather (more on that later), but as soon as I got home, he was combing through the pro pictures with me and watching my helmet cam footage. He was so proud of me and excited for me that he posted some of the pics (all purchased) on his facebook. If that doesn’t make your heart grow, I’m not sure what will. Both days were super long days since we had riders and horses in the first division of each day, and I was in the last division. Since Saturday and Sunday were held at different venues, we trailered out both days instead of stabling. However, that meant that May was on the trailer at 6AM on Saturday, and our first ride time was at nearly 2:30PM. May didn’t seem to mind. She drank really well all day and had plenty of grazing breaks throughout the day… and she took a few naps. All in all, a pretty good way to spend the day in May’s book. Bahaha… where am I going? Since day parking at the KYHP is so far from the Dressage complex, we got on pretty early to walk over… and then got lost. Oops. Luckily, Best Husband Ever was there, and he helped navigate me in the right direction. I started warming up quickly, thinking I was running late. May felt AMAZING. We had floppy Dressage ears. Does anyone know what I am talking about? She was ON IT. Then, there was a delay in our ring. so I let her walk on a long rein. Then, when we were one out, I picked her back up, did a few walk/trot transitions, as per my trainer’s recommendation. I threw in a quick canter transition, and we were ready to go in! Entrance, Halt, Proceed at Working Trot: 7.0 – Obedient to Halt. Square. I am surprised this scored so well. There was a ring and warmup running behind the judge’s booth… As soon as we came down centerline, May REALLY wanted to watch those rings. Circle Right 20M at A, with Canter: 6.0 – Prompt Transition. Lack of Bend and Poor Circle Shape. I got so excited about a decent up transition into the right lead canter, that I almost forgot to circle. Transition in and out of Canter: 6.0 – Well planned up transition. Unbalanced down transition. Circle Left 20M at E: 7.0 – Becomes a bit rushed. Loses shape a bit. She actually thought about giving me a canter transition here… hence the loss of rhythm. Circle Left 20M at A, with Canter: 7.0 – Better plan to start circle. Better quality canter. Transition in and out of Canter: 7.5 – Fairly good prep for transition. Medium Walk: 7.0 – Keep marching walk I was just super happy that she didn’t jig because she was getting VERY jiggy in warm-up. Free Walk: 7.0 – Covers Ground in FW. Show more stretch down. Agreed. Center line and Halt: 8.0 – Straight and Square. Rider’s Position: 6.5 – Keep eyes up! How could I be anything other than thrilled with that? Scores at schooling shows tend to be pretty soft, so I wasn’t sure where we were going to end up. However, I was really pleasantly surprised to see that 29.3, and it put us in second going into SJ!